Jerusalem center for social and economic rights said the economic situation in the occupied eastern part of Jerusalem has been the worst ever since its occupation. In a press interview with the Palestinian information center (PIC), director of the center Ziyad Hamouri stated that this situation was not a coincidence, but planned by the Israeli occupation regime which started its impoverishment scheme in the holy city with movement restrictions, barriers and then walls. Hamouri affirmed that the Israeli economic blockade on east Jerusalem weakened the purchasing power in the city greatly and affected the Palestinian tourism sector. He warned that the economic pressure by Israel on the natives in the holy city is aimed at ethnically cleansing it. The human rights activist also pointed out to Israeli reports that said the poverty line in east Jerusalem is estimated at 80 percent. This means, he added, that the demographic war of decreasing the Arab population to less than 12 percent which the Israeli regime declared may get results. In addition to that, he said, there are more than 20,000 demolition orders against Palestinian homes in the holy city, and the Palestinian authority's pledges about economic prosperity and foreign investments have always been airy words. The director of Jerusalemite center also noted that statistics had stated two years ago that there were more than 250 shops closed permanently by the Israeli occupation authority in the old city of Jerusalem, and many more have been shut down ever since. He highlighted as well the policy of daily fines and raids pursued by the IOA against Jerusalemite storekeepers to force them to leave their stores and the city. Such situation and many other Israeli restrictions had made the Jerusalemite storekeepers and merchants see no prospect for their survival the holy city, he warned. Jerusalem storekeepers and vendors were surprised on Monday to see Israeli municipal employees drawing yellow lines outside their stores and stalls and warning them not to go beyond them or else they would be fined. Such Israeli measure sparked outrage among the Palestinian traders in Al-Qatanin Souk of the old city of Jerusalem and prompted to engage verbally with the municipal staff. The storekeepers and vendors slammed such step as the last nail which the Israeli municipal council hammered in the coffin of the commercial movement in the old city of Jerusalem. One of the storekeepers said that the municipal council aims to force them to leave their stores and commercial activities in the old city as part of Israel's ethnic cleansing policy. For its part, the Aqsa foundation for endowment and heritage strongly denounced this Israeli measure and said it would destroy the commercial activities in the old city. The foundation noted that the Israeli occupation authority often resorts to malicious actions aimed at undermining the Arab presence in the old city and the areas around the Aqsa Mosque. Emir Qatar, Hamad Bin Khalifeh 'Al Thani, confirmed to Palestinian President Mahmoud Abbas, that his country will continue to stand by the Palestinian people in his resistance and will pay the dues of the Palestinian Authority (PA). President Mahmoud Abbas told Emir of Qatar that he will be warmly welcomed when he visits Palestine, and thanked him for his support of the Palestinian people. The Ministry of Agriculture announced the total losses of the agricultural sector due to the Israeli aggression on the Gaza Strip, stressing that this sector was the most affected sector. The ministry pointed out that the occupation has deliberately targeted the agricultural lands and facilities and wells, as well as ports, marinas, and vessels. D. Nabil Abu Shamala Assistant Undersecretary at the Ministry of Agriculture said, during a joint news conference with a number of ministries, that "the total agricultural losses hit $93.8 million, including $20.1 million as direct losses and $23.8 million as a result to the deterioration to the soil of an area of about 25 thousand Dunums in the border region, in addition to the $50 million indirect losses. He added that the indirect losses represented in the rest of the olive harvest and the beginning of the citrus season, and the inability to harvest vegetables, especially onion and tomato, in addition to preventing the export of berries at the height of the season, added to the delay in the planting season, which affected completely the productivity of the season. Abu Shamala also noted that 34 thousand fruit trees have been damaged as a result of targeting about 1,000 Dunums by the Israeli aircraft and artillery. The Balance of Payments (BOP) is an account measuring transactions between residents and non-residents in a given period. It is considered to be the peak of efforts in preparing systematic economic statistics that are necessary for observing economic performance in general and for deriving essential data used in compiling the Rest of the World Account as part of the Palestinian National Accounts. BoP consists of two main accounts, the Current Account and the Capital and Financial Account. The deficit value of the Current Account amounted to USD 2,192.6 million (21.5% of the GDP in current prices), compared with a deficit in year 2010 which amounted to USD 690.9 million. The deficit in the Trade Balance of goods amounted to USD 4,626.0 million (45.5% of the GDP in current prices). This deficit increased by 26.6% compared with the year 2010. The deficit in Services Balance amounted to USD 103.6 million reflecting a decrease of 66.8% compared with the year 2010. The decline in the deficit of Services Balance was caused by the increase of the Exports in Travel services, and decrease of imports of government Services. The Income Balance: The surplus of USD 1,217.2 million was recorded in this account, showing an increase of 10.8% compared with year 2010. The surplus was caused mainly by the surplus in Compensations of Employees working in Israel which reached USD 1,152.7 million, reflecting an increase of 16.3% compared with the year 2010, Meanwhile, the investments income received from abroad amounted to USD 99.3 million showing a decrease of 26.9% compared with the year 2010, caused mainly by a decrease in the earnings received on the Palestinian Foreign Direct Investments (FDI) and Portfolio Investments, invested abroad. According to the Net Current Transfers, the surplus value amounted to USD 1,319.8 million showing a decrease of 39.3% compared with the year 2010. The donors' current transfers was 43.4% of total value of receipts from abroad, meanwhile the current transfers received from abraod other than donors was 56.6% of total current transfers from abroad. The total value of receipts from abroad distributed as 38.0% for the government sector and 62.0% for other sectors (Private, Household and non-government organizations). The changes on Reserve Assets flows (decrease) amounted to USD 33.7 million in 2011, which are reflected in the Overall Balance surplus due to the absence of other financing resources. The damage control committee at the Ministry of Transport and Communications confirmed that the losses of the transportation sector in the Gaza Strip hit $3 million, as the primary outcome of the serious damage to the transportation sector. The committee has confirmed in a statement on Sunday that 120 files have been filled in so far, and that the damage to the citizens' vehicles, technical workshops and showrooms have been documented with photos in each file. It stated that these results represent the direct losses of the transportation sector while the indirect losses have not been counted so far. The damage to the vehicles and the heavy equipment belonging to the Palestinian government have also been counted, as a large number of the ministries' vehicles had been destroyed during the bombing of the governmental headquarters. The committee's report pointed out that the citizens' losses have reached $1.5 million; affecting the workshops, the dynamometer car test centers, the car showrooms and the spare-part stores. The survey showed that most of effected were technical workshops with an initial total loss of about $420,000, while the government vehicles losses hit $1.5 million. Prime Minister Ismail Haniya asserted that his government will help and support the farmers in the liberated border area. Prime Minister's remarks came during the launching ceremony of the projects of the Qatari grant, which include rehabilitation project of the agricultural labs for the Ministry of Agriculture. Meanwhile, Ali al-Tarshawi, the Minister of Agriculture, accompanied by the Qatari Ambassador Mohammed Al Emadi, held a visit to the rehabilitation project of the agricultural laboratories in al-Mashtal area in Gaza, which marked the beginning of the project. Al-Tarshawi pointed out that the Qatari grant will be directed to support the infrastructure in the agricultural sector, and called for focusing on supporting the liberated border areas, in the next phase. He added that the Ministry has plans and projects ready to be presented to the institutions supporting the Palestinian people, in order to re-exploit the lands on the borders, noting that the victory of the Palestinian resistance should be invested for the expansion of the agricultural area and to increase production. Hundreds of Palestinian teachers staged a sit-in in Jenin city on Sunday protesting the delay in disbursing their salaries. The teachers called on the Ramallah government to give civil servants, especially teachers, their rights. The teachers, who suspended classes in Jenin schools, threatened to escalate their syndicate protests if their salaries were not disbursed. They said that instead of honoring teachers on the teacher’s day they are being ignored. Civil servants in the West Bank are expected to start gradual strike steps on Wednesday if Salam Fayyad’s government did not pay their salaries. Sales of a citrus-scented perfume marketed in Gaza have soared since it was named in honor of the rockets that Palestinians shot at Israel during a war last month, the manufacturer said. "M-75" perfume, which comes in men's and women's fragrances, is named for the missiles Hamas Islamist militants shot at Tel Aviv and Jerusalem in an eight-day conflict that ended with an Egyptian-brokered truce. Although both sides proclaimed victory, and Israel said it had halted rocket fire at its towns, many in Gaza take pride in militants having shot a rocket as far as Tel Aviv, the longest-range aerial strike by the Palestinians so far. "I hope the smell is strong enough for them to whiff in Tel Aviv and remind the Jews of the Palestinian victory," Ahmed Hassan, a customer from neighboring Egypt, said as he bought 30 vials of the perfume as souvenirs in a Gaza City shop. Rajaey Odwan, director of Gaza's Continental Style perfume company which markets imported fragrances and local knockoffs, said he thought he'd give customers a chance to smell victory and "turn it into a perfume." He sells the 60 ml (2 oz) black-and-green bottles made of orange, lemon and other herbal scents collected in Gaza, for about $13 apiece. "Sales have gone through the roof," he said. The total value of imports of goods from all countries including Israel in 2011 was USD 4,221 million, an increase of 6.6 percent compared to 2010. Exports of goods totaled USD 720 million and increased by 25.0 percent compared to 2010. 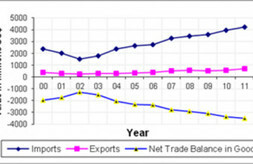 In 2011, the deficit in the net trade balance in goods increased by 3.5 percent compared to 2010 and reached to USD 3,502 million. Exports to Israel increased in 2011 by 26.5 percent compared to 2010 and reached USD 618 Million; exports to Jordan increased by 24.8 percent and reached USD 39 Million. Exports to the European countries also increased by 46.6 percent compared to 2010 and reached USD 15 Million. Imports from Israel was increased in 2011 by 2.3 percent compared to 2010 and reached USD 2,939 Million, imports from Jordan increased by 33.6 percent during the same period compared to 2010. Imports from European countries Also increased by 20.8 percent in 2011 compared to 2010 and reached USD 444 Million. The total value of imports of services from Israel in 2011 was USD 100 Million and decreased by 23.4 percent compared to 2010. Exports of services to Israel increased by 23.9 percent in 2011 compared to 2010 and reached USD 148 Million. More than 130 government buildings and utilities were damaged in the Israeli aggression on the Gaza Strip that lasted for eight days in November. The Arab Follow-up Committee decided, during its meeting Sunday in Doha – Qatar, to immediately implement a decision that was made during the Baghdad Summit late in March this year, by immediately starting the transfer of $100.000.000 to the Palestinian Authority every month. Palestinian Foreign Minister, Riyadh Al-Maliki, stated that the Arab leaders made several important decisions regarding the situation in Palestine, including providing a $100 Million monthly financial safety net to the Palestinians. The leaders formed a committee that includes the Prime Ministers of Qatar, Muhammad Al Thani, and Arab League Secretary-General, Nabil Al-Arabi, to ensure the implementation of these decisions. Al-Arabi will be sending messages to all Arab Foreign Ministers so that their countries pay their monthly commitments; he said that Arab states will have this month’s $100 M. ready within two weeks. On his part, Al-Maliki said that the actual monthly amount that Palestine needs is $240 Million, but the $100 M. decision was made at a previous summit. He also said that the Follow-up Committee decided to prepare for the Second Paris Conference to ensure sufficient funding for Palestine, and the reconstruction of the Gaza Strip devastated by repeatedly Israeli wars and military aggression. Al-Maliki also stated that the Arab leaders stressed on the importance that peace talks between Israel and the Palestinians must be based on all related legitimacy and international resolutions, and also stressed on the necessity to pressure Israel into stopping all of its settlement activities, and the release of all Palestinian detainees, mainly those who have been imprisoned since before 1994. Arab leaders will also be forming a ministerial delegation that includes the Prime Minister of Qatar and the Arab League Secretary-General, along with any Arab leader who wishes to join, in order to hold talks next month with the UN Security Council, America, Russia, the European Union and China to ensure the release of the Palestinian political prisoners held by Israel, and to protect the legitimate rights of the Palestinian people, in addition to ensuring that Israel stops all illegal Israeli settlement activities, in the occupied West Bank and occupied West Jerusalem, as settlement construction and expansion mounts to a war crime and violates international Law . They also decided to help Palestine obtain membership in all international institutions allowed by International Law; a total of 16 international institutions and 31 international treaties, and said that the naval, ground and aerial Israeli siege on the Gaza Strip, that led to the death of hundreds of patients, must be lifted without any delay. The Palestinian Authority government on Thursday slammed Israel's seizure of its tax revenues after Palestine won a UN status upgrade as a "policy of piracy". In its weekly meeting, the cabinet urged the international community to put an end to what it called "the Israeli policy of piracy." Israel's government said Sunday it will use the 460 million shekels ($120 million) of November tax payments to pay PA debts to the Israeli Electric Company after the UN vote admitting Palestine as a non-member state. "The international community (should) reject this blackmail and compel Israel to transfer our tax revenues," a PA cabinet statement said Thursday. The government applauded the UN vote as the "fruit of our people’s continued and decades-long struggle to achieve their natural right to self-determination, and a victory for our people’s determination to realize all its national rights." The Israeli government also unveiled plans on Friday to build 3,000 new settlement units and expedite building in the so-called E-1 area of the occupied West Bank, a day after the UN vote. Building in E-1 "threatens the possibility of enshrining the Palestinian state on the land occupied by Israel in 1967, with East Jerusalem as its capital," the government said. Further they "constitute a flagrant defiance of the international community's will" reflected by the UN vote, the cabinet statement continued. At the General Assembly, 138 member states voted for Palestine's boost in status. The PA welcomes European efforts to protest the settlement acceleration, but called for "concrete action." The Palestinian leadership will "engage the UN Security Council to confront settlement construction and compel Israel to stop these activities," it added. The Deputy Chairman of the Gaza Energy Authority, Fathi al-Sheikh Khalil, expects to use 4 generators in January next year, if there is enough fuel. Sheikh Khalil talked about the authority's plan which enabled the continuation of electricity supply as usual to the people of the Gaza strip during the last Israeli aggression on the coastal Strip, despite targeting the main electricity supply lines and the shortage in fuel received from the Egyptian side. He noted in a written press statement on Wednesday that closure of shops and institutions, during the war, resulted in surplus electricity supply to provide to the homes of Gaza and less power cuts. He praised the role of workers in the electricity distribution company, and their determination to complete their work in spite of the Israeli bombing. Sheikh Khalil said that the Energy Authority continued, during the aggression, with its counterpart in the occupied West Bank as well as with the International Red Cross their work to avoid a humanitarian disaster in the Gaza Strip as a result of the power shortage. The Ministry of Tourism and Antiquities in Gaza estimated the overall losses suffered by the tourism sector after the Israeli aggression on Gaza about a quarter of a million dollars, noting that this sector still suffers from the losses during the Israeli aggression in 2008. The Ministry of Tourism and Antiquities has ended the estimation of all the damage, which affected touristic and archaeological sites during the recent aggression on the Gaza Strip. Mohammed Khallat, Assistant Undersecretary of the Ministry of Tourism and Antiquities, stated in a press release, that the occupation targeted in the recent aggression several archaeological sites and tourist facilities deliberately. He added that since the end of the aggression the ministry formed a special committee to inspect these facilities and to estimate the damage. Khallat explained that tourist facilities and archaeological sites had been targeted during the Israeli aggression in 2008 where the sector's losses was estimated at the time about $ 20 million, but the occupation has targeted them for the second time in this recent aggression. He noted that targeting tourist and archaeological sites "aims to blur the history and civilization of the Palestinian people that constitute an obstacle to the Israeli allegations and projects. Khallat stated that the occupation has aimed in the recent aggression to destroy the local tourism sector, which constitutes an essential pillar of the national economy, where the Israeli warplanes seriously damaged the buildings and the headquarters of these tourist facilities, in addition to targeting telephone and electricity networks. Regarding the archaeological aspect, he explained that there are significant losses in the archaeological sector estimated about 65 thousand dollars. Some historic buildings have been targeted by the occupation directly as a Byzantine church in the northern Gaza Strip which was bombed, in addition to the destruction of parts of the ancient mosaic floors in the church, he explained. He appealed all the international human rights organizations and the World Tourism Organization to bear their responsibilities, stressing that the ministry will report the damage caused by the Israeli occupation to all the international and human rights organizations particularly UNESCO to prosecute the occupation for its crimes. Israel is unlikely to follow through on its announcement that it will withhold Palestinian Authority tax revenues, PLO official Muhammad Ishtayya said Monday. Israel's cabinet said Sunday it will use the 460 million shekels ($120 million) of November tax payments to pay PA debts to the Israeli Electric Company. Ishtayya told Ma'an: "Israeli leaders are just making hasty and prompt remarks to save face. In fact these threats mirror the grand statements Israeli leaders made before the Palestinian Authority submitted its statehood bid to the UN General Assembly." "We know these remarks are aimless threats which Israel will not dare to put into effect because they will then have to face huge pressure from the international community, as nobody in the world wants to see the PA collapse." Ishtayya said the fact that Israel had delivered the PA tax revenues only two days before the Palestinian president headed to the UN shows they are not serious. But Palestinian Authority spokeswoman Nour Odeh highlighted that the payment had been a delayed installment from October's taxes, and until now the government has no indication that Israel will reverse the decision. Israeli premier Benjamin Netanyahu's insistence that he will proceed with accelerated settlement building, the other punitive action after the UN bid, despite world outcry, indicates that his government is "unphased by international reactions," she said. Israel's government decided to seize Palestinian Authority tax revenues in response to the UN vote to recognize Palestine as a non-member state, Israeli media reported Sunday. Israel will use the 460 million shekels ($120 million) of November tax payments to pay PA debts to the Israeli Electric Company, the Haaretz newspaper reported. Finance Minister Yuval Steinitz told the Sunday cabinet meeting that UN vote is a "Palestinian provocation and an attempt to advance their state without recognizing Israel," new site Ynet reported. Steinitz said Sunday: "It is high time that Jerusalem will be connected to (Israeli settlement) Maale Adumim. We told the US that if the Palestinians would go to the UN there would be repercussions." The United States, one of just eight countries to vote alongside Israel against the Palestinians at the UN General Assembly, had called the latest expansion plan "counterproductive." Israel had threatened a number of sanctions in response to the bid, including withdrawing Palestinian tax revenues, supporting more settlement building, and canceling past agreements. Israeli media reported that US Secretary of State Hilary Clinton had urged Israel not to punish Abbas' administration for the bid, and West Bank officials were optimistic that she had been successful. Israel has withheld the tax revenues, which it collects on the PA's behalf as a result of international agreements, several times in recent years to punish the PA leadership. The government also held back a smaller sum, around $9 million, in September to pay the Israeli Electric Corp., which supplies West Bank cities with power. Israeli officials say the Palestinian Authority's Jerusalem District Electricity Co. has accumulated a $200 million debt from the company in unpaid bills. The aid-dependent Palestinian economy in the West Bank faces financial crisis due to a drop in aid from Western backers and wealthy Gulf states, as well as Israeli restrictions on trade. Jerusalemite store owners said the Israeli municipal council opened recently an office in Bab Al-Amoud area in the old city of Jerusalem aimed at tightening its restrictions on them. According to Wadi Hilweh information center, the Palestinian shopkeepers of the old city of Jerusalem were surprised to see a municipal office opened near their stores, specifically near the area where Israeli border guards stand every day. It noted that two Israeli civil servants normally stay in the office with a motorbike bearing the Israeli municipal logo parked outside. The shopkeepers described the opening of this office as a serious precedent aimed at restricting their commercial activities and raiding their stores suddenly and anytime to fine them and confiscate their goods.